In Part 3 of this series we showed how to install and configure a basic NexentaStor VSA using iSCSI and NFS storage. We also created a CIFS bridge for managing ISO images that are available to our ESX servers using NFS. We now have a fully functional VSA with working iSCSI target (unmounted as of yet) and read-only NFS export mounted to the hardware host. In this segment, Part 4, we will create an ESXi instance on NFS along with an ESX instance on iSCSI, and, using writable snapshots, turn both of these installations into quick-deploy templates. We’ll then mount our large iSCSI target (created in Part 3) and NFS-based ISO images to all ESX/ESXi hosts (physical and virtual), and get ready to install our vCenter virtual machine. With a lot of things behind us in Parts 1 through 3, we are going to pick-up the pace a bit. Although ZFS snapshots are immediately available in a hidden “.zfs” folder for each snapshotted file system, we are going to use cloning and mount the cloned file systems instead. Cloning allows us to re-use a file system as a template for a copy-on-write variant of the source. By using the clone instead of the original, we can conserve storage because only the differences between the two file systems (the clone and the source) are stored to disk. This process allows us to save time as well, leveraging “clean installations” as starting points (templates) along with their associate storage (much like VMware’s linked-clone technology for VDI.) While VMware’s “template” capability allows us save time by using a VM as a “starting point” it does so by copying storage, not cloning it, and therefore conserves no storage. Using clones in NexentaStor to conserve storage and aid rapid deployment and testing. Only the differences between the source and the clone require additional storage on the NexentaStor appliance. While the ESX and ESXi use cases might not seem the “perfect candidates” for cloning in a “production” environment, in the lab it allows for an abundance of possibilities in regression and isolation testing. In production you might find that NFS and iSCSI boot capabilities could make cloned hosts just as effective for deployment and backup as they are in the lab (but that’s another blog). Basic storage architecture for the ESX-on-ESX lab. In Part 2 of this series we introduced the storage architecture that we would use for the foundation of our “shared storage” necessary to allow vMotion to do its magic. As we have chosen NexentaStor for our VSA storage platform, we have the choice of either NFS or iSCSI as the storage backing. In Part 3 of this series we will install NexentaStor, make some file systems and discuss the advantages and disadvantages of NFS and iSCSI as the storage backing. By the end of this segment, we will have everything in place for the ESX and ESXi virtual machines we’ll build in the next segment. For DRAM memory, our lab system has 24GB of RAM which we will apportion as follows: 2GB overhead to host, 4GB to NexentaStor, 8GB to ESXi, and 8GB to ESX. This leaves 2GB that can be used to support a vCenter installation at the host level. 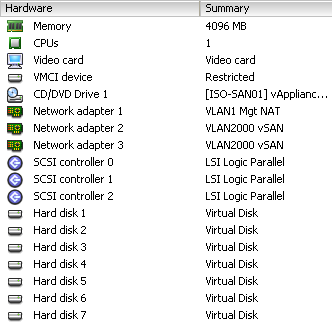 Our lab mule was configured with 2x250GB SATA II drives which have roughly 230GB each of VMFS partitioned storage. Subtracting 10% for overhead, the sum of our virtual disks will be limited to 415GB. Because of our relative size restrictions, we will try to maximize available storage while limiting our liability in case of disk failure. Therefore, we’ll plan to put the ESXi server on drive “A” and the ESX server on drive “B” with the virtual disks of the VSA split across both “A” and “B” disks. For lab use, a VSA with 4GB RAM and 1 vCPU will suffice. Additional vCPU’s will only serve to limit CPU scheduling for our virtual ESX/ESXi servers, so we’ll leave it at the minimum. Since we’re splitting storage roughly equally across the disks, we note that an additional 4GB was taken-up on disk “A” during the installation of ESXi, therefore we’ll place the VSA’s definition and “boot” disk on disk “B” – otherwise, we’ll interleave disk slices equally across both disks. NOTE: It is important to realize here that the virtual disks above could have been provided by vmdk’s on the same disk, vmdk’s spread out across multiple disks or provided by RDM’s mapped to raw SCSI drives. If your lab chassis has multiple hot-swap bays or even just generous internal storage, you might want to try providing NexentaStor with RDM’s or 1-vmdk-per-disk vmdk’s for performance testing or “near” production use. CPU, memory and storage are the basic elements of virtualization and there is no reason that storage must be the bottleneck. For instance, this environment is GREAT for testing SSD applications on a resource limited budget. In Part 1 of this series we introduced the basic Lab-in-a-Box platform and outlined how it would be used to provide the three major components of a vMotion lab: (1) shared storage, (2) high speed network and (3) multiple ESX hosts. If you have followed along in your lab, you should now have an operating VMware ESXi 4 system with at least two drives and a properly configured network stack. In Part 2 of this series we’re going to deploy a Virtual Storage Appliance (VSA) based on an open storage platform which uses Sun’s Zetabyte File System (ZFS) as its underpinnings. We’ve been working with Nexenta’s NexentaStor SAN operating system for some time now and will use it – with its web-based volume management – instead of deploying OpenSolaris and creating storage manually. While the performance features of NexentaStor/ZFS are well outside the capabilities of an inexpensive “all-in-one-box” lab, the concepts behind them are important enough to touch on briefly. Once understood, the concepts behind ZFS make it a compelling architecture to use with virtualized workloads. Eric Sproul has a short slide deck on ZFS that’s worth reviewing. Legacy SAN architectures are typically split into two elements: cache and disks. While not always monolithic, the cache in legacy storage typically are single-purpose pools set aside to hold frequently accessed blocks of storage – allowing this information to be read/written from/to RAM instead of disk. Such caches are generally very expensive to expand (when possible) and may only accomodate one specific cache function (i.e. read or write, not both). Storage vendors employ many strategies to “predict” what information should stay in cache and how to manage it to effectively improve overall storage throughput. New cache model used by ZFS allows main memory and fast SSDs to be used as read cache and write cache, reducing the need for large DRAM cache facilities.